The abstract of title came in the mail today. This shows the complete history of ownership and vessel names for Satori. I am the 5th owner of Satori which was once named Bittersweet. It seems that the hull was built in Costa Mesa by Westsail Corp but was then finished in Issaquah, WA by a couple of master carpenters. In 1987 the homeport was declared in Juneau, AK and then finally Edmonds by the last owner in 2000, which is closest the where I currently live. The boat was once purchased for as much as $46,000 and likely still retains much of that worth even to this day. A letter came along with the abstract to explain why my application to transfer ownership was not accepted. The application CG-1258 was rejected for two reasons. It seems that I failed to complete section J (Endorsements) and M3 (State in which the vessel is titled). It took the USCG approximately 9 days to notify me of my incomplete application. It seems odd that I sent the application in an email but they responded in a letter, as opposed to just replying to my email with the notification. In order to rectify this I need to fill out another application, print it, sign it, scan it and then finally email it. Hopefully this time the application will be accepted and I can finally be finished with the documentation. Wish me luck! Apparently I completely missed the notarized release of interest on the licensing website. No luck getting this completed this week. Maybe next week. One the documents are all completely filled out, I then need scan the signed copies and scan the Certificate of Documentation front and back and attach to an email and finally send that to NVDC.PDF.FILING@uscg.mil. I went ahead and called the coast guard document office to confirm everything so as far as I can tell this is exactly the procedure to get the paperwork completed. The credit card authorization form is secure as long as you use a secured email server. If you have a gmail account and use a web browser to upload documents and send the email you can be assured that the attached files with all of the personally identifiable information are safe from being publicly exposed. Don’t ever send email with your PII in the body of the email. This ensures that you’re mostly secure from malicious interception through SSL. To complete this I still need the Release of Interest/Power of Attorney sent to me from the owner after he fills it out, prints it, signs it and then has a notary public sign it. 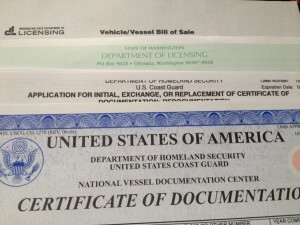 Finally I can then take the packet of documents into the licensing office and do the transfer of ownership, which includes paying taxes on the vessel. Yay! Bill of sale arrived today! 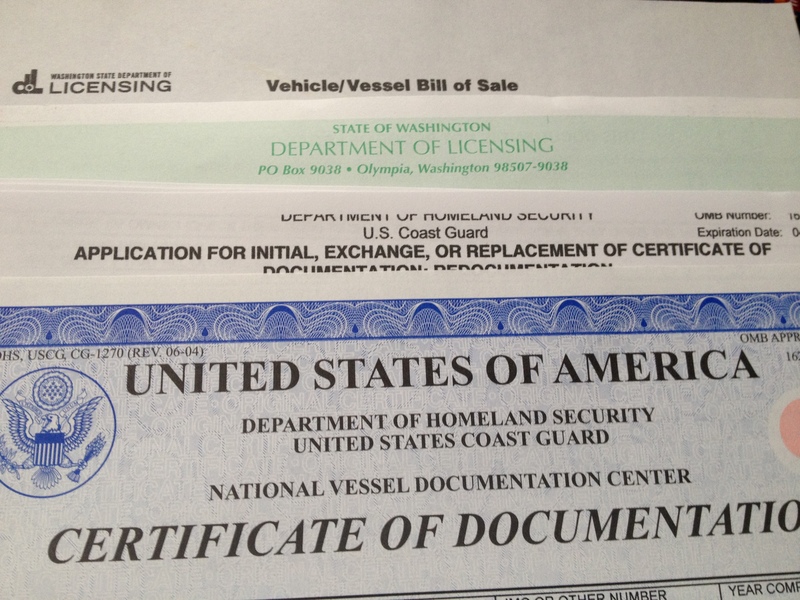 I am a bit confused on how to pay for a new certificate of documentation from homeland security and transfer ownership at the same time. There is info on fees at the coast guard website but no instructions that I can see on how to send credit card info. Apparently they are still using fax to collect official documents. Who has fax anymore? Anyways, I have filled out their CG-1258 document and made a digital copy to email. I’ll call in the morning and figure out how to do the annual renewal and transfer at the same time and figure out the cost and how to send a secure payment. I’m heading into the licensing office in the morning to pay taxes and get the registration in my name as well. Next up, getting an MMSI account for AIS.